Disclaimer The following code is a thought experiment, not a battle-hardened #Enterprise web framework. I haven't used it in production or built a real product with it. Use it at your own risk. The xstream library is a simplified take on heavy observable libs like RxJS. The xstream API is superficially different from RxJS or the TC39 Observable specification but the differences are not relevant for this example. So far, xstream has done nothing to make our code better. To add a little extra motivation, let's start with some simple routing. In API land, routing means mapping an HTTP request for a URL like GET /foo to a function that handles the request and formats a response. For the purposes of this article, a request handler will be a function that takes in the raw request and returns a Promise. You may think it's strange to use both promises and observables, but there's a few reasons to rely on promises: co returns promises, promises are easy to chain, and more developers understand promises. Here's the code for an xstream-based server that prints 'Hello, World' if you hit the / endpoint, and returns an HTTP 404 otherwise. map(route('/', () => Promise.resolve('hello, world'))). The classic use case for middleware is authentication: making it so that certain endpoints return an HTTP 401 if the proper authorization header is not set. With a little help from promise chaining, you can create a promise that resolves if auth succeeded and rejects if auth failed, and then chain that promise to your route's promise. map(route('/auth/test', () => Promise.resolve('my hidden route'))). You might wonder why the above example uses an if statement in them map() for routing instead of filter() and then map(). This is for the benefit of the notFoundHandler. The filter() operator creates a new observable that only emits events that match the given filter, but we eventually want every HTTP request to reach the notFoundHandler to check if the request has been handled or not. One neat side effect (pun intended) of this architecture is that error reporting becomes trivial. Say you use sentry or raygun or whatever your error tracker of choice is. All you need is to subscripe to the server$ observable and .catch() any errors that occur. const urlWithoutQueryString = q === -1 ? The advantage of attaching convertAssertionErrors() as another .map() is that convertAssertionErrors() gets called on every HTTP request, without the individual route handler being aware of it. Furthermore, convertAssertionErrors() can slice the requests stream any way it wants. For example, you can make assertion errors become HTTP 500 errors for a certain set of endpoints. 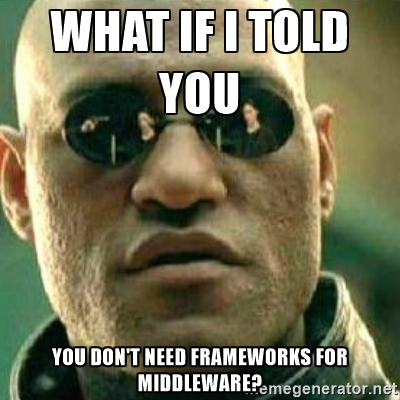 In other words, you get the benefits of middleware without the framework lock-in. Further reading: Node server with Rx and Cycle.js approaches a similar idea from a different angle. Observables or not, I believe that co and generator-based concurrency is the bedrock of REST API development in Node.js. If you're not familiar with generators, check out my ebook The 80/20 Guide to ES2015 Generators. 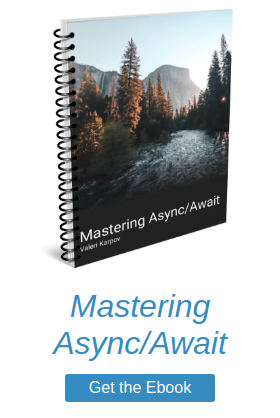 It will take you from zero to generators master in 50 pages, with no dependencies outside of Node.js.